(CNN) -- China recorded its first death Friday from a moderate earthquake that struck the country's southwest the night before, state-run media reported. Rescue workers attend to the scene of the earthquake which hit southwest China on Thursday. The quake hit Yunnan province in southwest China on Thursday evening, leaving one dead and about 325 injured -- 24 of them in serious condition, the Xinhua news service said. Xinhua reported the quake as having a 6.0 magnitude, while the U.S. Geological Survey revised the magnitude to 5.7. More than 18,000 homes were destroyed by the quake, which happened at 7:19 p.m. (11:19 a.m. GMT) Thursday, at a depth of about 10 kilometers (6.2 miles), according to Xinhua. More than 400,000 people in the quake zone had to be evacuated or relocated, the news agency said. 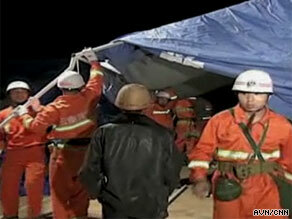 Tents, medicine and food were being distributed by relief authorities, Xinhua said. Thursday's earthquake comes more than a year after a massive quake struck Sichuan province in China on May 12, 2008. That 8.0-magnitude quake killed more than 68,000 people, left nearly 18,000 missing and displaced 15 million others.